Paul Shorrock | Illustrator | Change is the only constant? Change is the only constant? My old Physics teacher used to say "Change is the only constant" but he wasn't talking about organisational change and he hadn't reckoned on Brexit uncertainty. 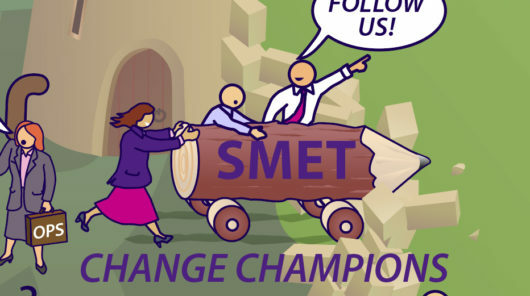 The bulk of my Rich Picture work is done in support of change programmes of some sort or another. Large organisations reach a point where they cannot maintain a competitive edge soldiering on with legacy systems and cultures stuck in the old ways, failing to take advantage of the benefits of live data available to all who need it, or of the economies and scaleability of shared services and outsourcing. Change is painful and expensive though so most organisations defer it longer than they should. It takes a brave leader to mobilise a diverse and distributed workforce, often with distinct cultures and systems, almost always overworked and fully focussed on putting out that day’s fires, and drag them out of their bunkers, from behind their parapets of in-tray and out-tray, blinking into the light to stare towards the steep hill, where the dawn of a new day is breaking, like Churchill’s ‘sunlit uplands’. Onwards and upwards! Continuous Improvement! So how much harder to drag these sedentary salary earners out of their comfort zones and up their own personal Kilimanjaro if the ‘sunlit upland’ is nowhere to be seen. That distant glow atop the hill is possibly a volcano about to blow. Tectonic shifts are moving more than just the goalposts. Continents are rearranging. Huge changes are in play BUT nobody knows where the pieces are going to fall. So why would you choose to set out on this challenging journey anytime soon? Best just to hunker down, stick to BAU and wait for the storm to pass. Consequently investment in UK businesses is on a steep downwards decline, year on year, and any efficiency shortfalls are being plugged by hiring more staff and throwing man-hours (person-hours!) at the problem. It’s not sustainable, it’s not creating the sort of go-ahead, connected, agile economy this country will need to be to stand alone in these islands in competition with other nations (why does the word “Nation” even have currency in the 21st Century?). Today we can add a new neologism to the expanding Brexit thesaurus- “Flextension” an open ended flexible extension to Article 50 in order to give the UK a chance to define what sort of a Brexit we get (not what we want, that is undefinable). I’m going to attempt to stay Leave/Remain-neutral in this post. It matters not one jot whether you voted one way or the other or are left or right (it’s a 3-D matrix now) it’s the continuing UNCERTAINTY that is killing my small business. I’m just one man, but imagine the combined logjam of change programmes delayed, postponed or stillborn and the negative, sclerotic effect that must be having on the UK as a place to do business.